Benefit from same-day crowns created with the advanced CEREC technology. The techniques offered at Choice One Dental Care of Newnan are the most advanced available, and our high-quality materials give stunning results! 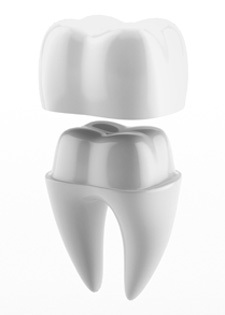 Crowns can be used when your tooth can no longer hold a filling or has been damaged from an accident or trauma. The process is completed in a single visit and takes just 1-2 hours. Dr. Galbo has been using CEREC technology for nearly two decades and has completed over 20,000 restorations! He’s trained hundreds of dentists on the proper use of CEREC, and we have the latest hardware and software to make sure you achieve the greatest results. Recovery takes only a day. The CEREC machine isn’t commonly found in our area, and it allows us to create crowns for all of your teeth. In rare cases, we may need to involve an outside laboratory. Choice One Dental Care of Newnan also offers crown lengthening. If you have a tooth that’s decayed or broken down below the gum tissue level, this minor surgical procedure allows us to gain more root to work with. A crown can be placed at the same time, keeping your visit efficient and effective. Contact us today to find out what we can do to transform your smile! Insurance is accepted, and payment plans are available.